This was published as a Wall Street Journal Think Tank column on July 8, 2016. Americans across the country were rattled and outraged at recent incidents of police violence against minorities, this time in Baton Rouge and Minnesota–followed by a stunning sniper attack on police officers as they did their jobs alongside peaceful protesters in Dallas. These events pull us in conflicting directions: Support the police who so often, and selflessly, serve us so well, and support the minority communities whose residents are victims of discrimination by those sworn to protect them. The conflict is conspicuous in the statements of our leaders: condemning evident racism and discrimination by police; strongly supporting the police who put their lives on the line to do their jobs right, as the vast majority do every day; supporting peaceful protests and the Black Lives Matter movement; and harshly condemning the ambush of police in Dallas. During a presidential campaign voters naturally focus a great deal on the words and actions of national candidates and leaders. This is also a time, however, when mayors, police chiefs, and other local leaders can make a big difference. The pervasive sense of discrimination and mistreatment minorities feel at the hands of police and other institutions of authority cannot be overlooked. This is especially true of younger minorities and is at the core of many interrelated issues. 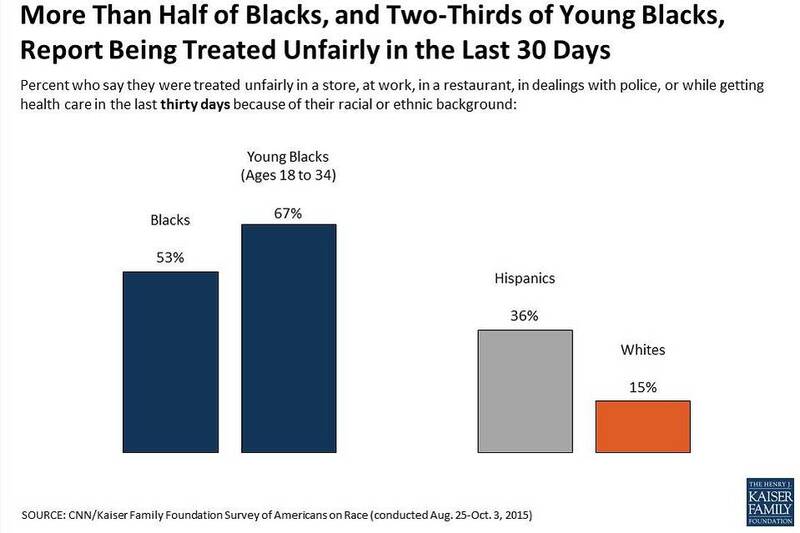 As indicated by the chart above, which is drawn from a Kaiser Family Foundation-CNN poll on race in the U.S., two-thirds of young blacks say that they have been treated unfairly in the last 30 days because of their race. 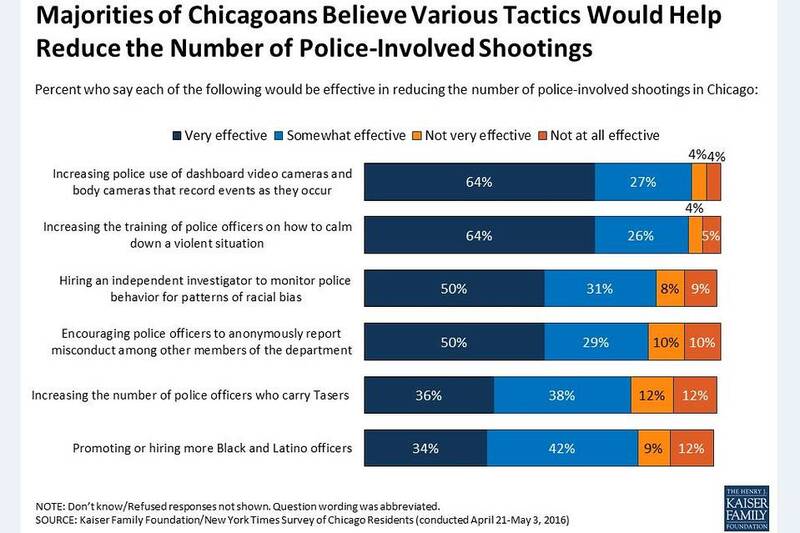 A survey of Chicago residents by Kaiser and the New York Times found broad agreement among the public on a variety of steps that can be taken to reduce police-involved shootings, including expanding the use of dashboard cameras and body cameras, expanded use of tasers, better training, and diversifying police forces by hiring more minority officers. Virtually all of these measures can be implemented at the local level. Other steps not included in the chart but that can also help include expanding community policing. If local officials move quickly to address these recent crises, they could find opportunities to put in place measures that may have been blocked in some communities by local politics or lack of funding. What our elected national leaders say in the immediate aftermath of such traumatic events matters. A Justice Department investigation can be important as a way to redress civil right violations, to enforce laws on the books, and to act as a deterrent. The FBI can aid in investigations. Governors and state attorneys general can step in when needed. But many of the problems between police and minority communities are uniquely local, and leadership from mayors and police chiefs can make a huge difference if they seek to work effectively with communities and move expeditiously to implement changes. Will House Republican Health Proposal and Trustees’ Report Make Medicare a Factor in Election?